Double Hedges Solaris from Bedfordshire is the first English wine to win a ‘Wine of the Year’ Trophy in the 2018 Sommelier Wine Awards. Bedfordshire-based English wine producer, Geoff Buckingham, has achieved an impressive hat-trick with his Double Hedges Solaris 2015 in the prestigious Sommelier Wine Awards (SWA) which sees around 3000 wines entered from all over the world. 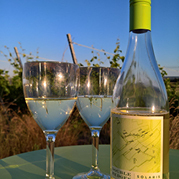 The still wine, made from Solaris grapes grown in vineyards near Toddington, has won a ‘Gastropub Wine of the Year’ trophy as well as a Gold medal and ‘Food Match’ award (with Avocado Toast). English wine was only given its own category in the Sommelier Wine Awards in 2013 and English wines have performed very well since, year on year, but Double Hedges is the first English wine to win one of the SWA’s coveted ‘Wine of the Year’ trophies. Geoff works as an IT consultant in London during the week and runs Double Hedges at weekends and in the evenings. The vineyard which was first planted in 2012, is part of a larger arable farming business run by Geoff’s brother, Edward and father, David. It is one of only two vineyards in Bedfordshire, the other being the community vineyard, Warden Abbey. Double Hedges Solaris is made by the talented winemaker, Clive Vickers and his team at Halfpenny Green in Staffordshire. The 1.1 ha Griffin Farm vineyard is close to Toddington’s village centre and is named after the carved griffins on St George’s medieval church whose ground adjoin the farm and village green. The vineyard is situated on a south-facing slope at 52 degrees latitude, between 110m and 130m above sea level and is planted to Bacchus and Solaris. The Bacchus (0.4 ha) is grown in the most sheltered part of the valley whilst the Solaris (0.5 ha) is planted in the most exposed section towards the top of the hill. The remainder of the vineyard is made up of experimental plantings such as Pinot Noir, Chardonnay, as well as the more obscure Turan (Agria), Bolero, Cabernet Cortiz, Pecorino and Marechal Joffre, amongst others. Although situated only one mile from the terminus of the chalk that features so heavily in the terroir of many UK vineyards, Toddington itself and the vineyard are situated on top of a deposit of glacial sand and gravel resulting in a vineyard soil mostly limited to sand and flint which is well suited to still wines. Bedfordshire is one of the counties furthest from the sea in the UK. Solaris is a grape variety of Germanic origin dating back to 1975 and its family tree includes Pinot Gris and Riesling amongst its ancestors. The Solaris grape is special as it is resistant to both downy & powdery mildew while being able to ripen in cool climates thanks to its large, disease-resistant leaves. This means it requires minimal intervention, thus reducing the impact on the environment and production costs. There is no need to chaptalise or de-acidify as the grape ripens to close to ideal sugar levels and acidity for still white wine in the UK. Posted in Consumer News, Trade News and tagged Solaris, Awards, Competitions, Bedfordshire, Sommelier, SWA, Wine of the Year.